Home » Activism » Stop the world’s biggest whale slaughter (Petition) Please sign – let’s get to one million! Stop the world’s biggest whale slaughter (Petition) Please sign – let’s get to one million! In a few days, Norway will start up the horrific annual slaughter of hundreds of mostly pregnant whales. We can stop it before it starts. Click here to add your name – let’s get to one million people!!! Norway has managed to slip under the radar as the #1 whale slaughtering country. 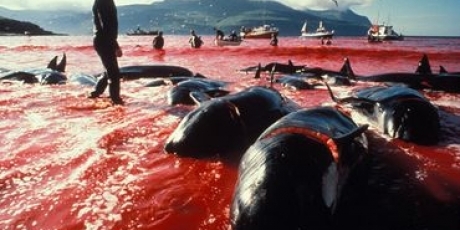 But if we now rally unprecedented global outrage, we can push Europe to close its ports to Norway’s whalers. We did it with Iceland — let’s do it again! Our movement and our partners already got Germany and the Netherlands to move to shut their ports to Icelandic whalers, got a major Icelandic whale hunter badboy to shut down his operations, pressured the International Whaling Commission to clamp down on “scientific whaling”, and helped set a path to have 30% of our oceans protected by 2030. Norway has got away with this mass murder for too long and the government just announced that it’s intending to double its slaughter quotas! But it is only profitable if they can export, and they rely on European ports to ship their bloody whale meat overseas. Let’s end Norway’s trade of these magical species. When 1 million of us have joined, Avaaz will pull out all the stops to make this a PR nightmare until every port in Europe rejects them and Norway stops whaling once and for all. Add your name now and tell everyone — let’s turn up the heat to save the whales! Momentum is moving towards ending this barbaric slaughter. But it’s the brutal whaling lobby vs. us — we need to sing for the whales as they cannot defend themselves. Let’s make this so loud we can’t be ignored and help end whaling for good.